Brobury House & Gardens win National Garden Award Congratulations to Brobury House & Gardens on winning Horticulture Week Custodian Award. Shortlisted months ago for the prestigious Custodian Award for their magnificent Herefordshire Gardens. The Horticulture Week Custodian Awards were held at Woburn Abbey – it was announced Brobury House & Gardens were the winners in the Best Gardens or Arboretum category 1-5 staff, against stiff national competition. The Horticulture Week Custodian Awards honour the achievements of professionals that make the UK’s parks and gardens the vital and vibrant places they are today, ensuring those achievements are recognised by the industry’s customers, clients and stakeholders. Management achievement is recognised with categories celebrating outstanding work across all areas of activity including restoration and redevelopment, on-going management and maintenance, partnership working, volunteer and community engagement, and more. Learn more about the awards and winners Why not take visit these wonderful gardens which are open all year round and see for yourself. With the gorgeous Summer we are having the gardens are at their absolute stunning best, so take the family and a bring a picnic, stay awhile and enjoy the views. More about Brobury House. A Herefordshire-based company which specialises in cooking up delicious Polish street food has been selected as one of three finalists in BBC Radio 4’s Food and Farming Awards. Old Granary Pierogi, which is based in Marden, is now in the running to be crowned the winner in the Street Food or Takeaway category, having faced competition from around 400 other nominees across the country. The family-run company – comprising Emilia Koziol-Wisniewski, husband Piotr and brother Jacek Koziol– was visited by judges Nigel Barden and Tom Parker-Bowles at their Marden base on April 20. Emilia said: “We feel incredibly overwhelmed to have been recognised on this scale and that so many people made an effort to nominate us. “It meant so much to us to be able to host the judges at our base in Herefordshire and showcase the passion that we, and the county has, for food and drink.” The winners of the competition will be announced at a ceremony in Bristol on June 13. For more information contact Emilia on 07706197311. Read more about Old Granary Pierogi. Hereford Cathedral offers December fun thanks to The National Lottery! On Wednesday 22 November 2017 ESL will be exhibiting at The Herefordshire Rural Business Advice Day at the The Three Counties Hotel in Hereford. Visit our stand to enter our prize draw to win an award-winning *cream tea for 2 at the wonderful Trumpet Corner Tearooms, Gallery and Gardens. 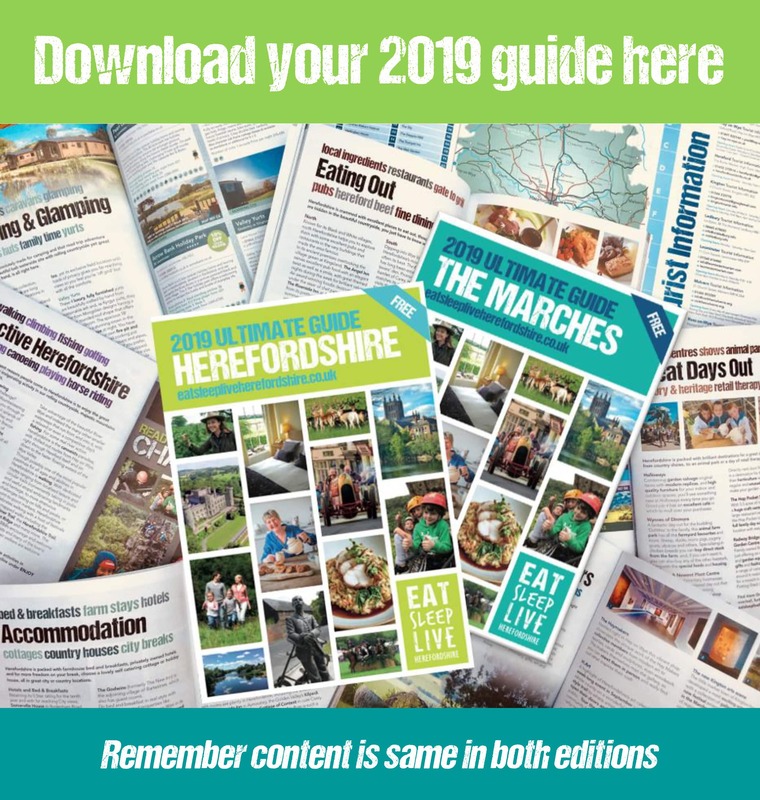 Come and talk to us about how to market your Herefordshire tourism business and how you can be part of this tourism revolution, promoting Herefordshire as a great destination to Eat, Sleep and Enjoy. Alongside us will be our sister company, Minx Media Ltd, offering consultancy advice and support in Marketing, specialising in helping rural Herefordshire business. Top 25 Grand Designs architect Garry Thomas, from Thomas Studio, will also be partnering us on our stand. Garry specialises in innovative self-builds, converting buildings for tourism use and successful planning applications in our Herefordshire countryside and will be on hand to offer support and advice on your rural planning issues. So, if you’re looking to convert or enhance your rural buildings for tourism, need marketing support or just fancy winning the cream tea, come to our stand and get the conversation going. *T&C’s apply. Eat Sleep Live Herefordshire is an independent tourism marketing organisation supporting not only Herefordshire’s food and drink businesses, accommodation providers, activities, leisure venues and pursuits, and events, but we also promote the county’s crafts, creatives and artisans, its beauty, culture and heritage, plus its music and unique vibe.